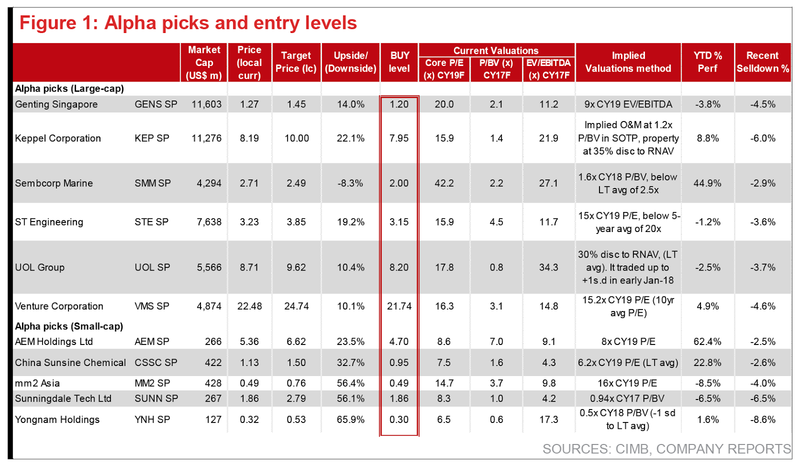 In preparation of a market bounce-back, we list five ‘must-own’ stocks backed by valuations and fundamentals: Keppel Corp, Venture Corp, ST Engineering, Genting Singapore and AEM. Our Alpha list: we remove Memtech given its YTD outperformance, and add ST Engineering and China Sunsine; others remain: UOL, Sembcorp Marine, mm2 Asia, Yongnam and Sunningdale. Our FSSTI target of 3,600 is intact. Fears of US Fed Fund rate hikes and inflations, coupled with the Dow's plunge, snowballed into a falling FSSTI. Sectors that have fallen the most in the past two days are capital goods, gaming (-4.5%) and tech/manufacturing (-4.9%) vs. FSSTI’s -3.5%. Our bottom-up FSSTI target of 3,600 remains unchanged for now, with expectations 8% EPS growth for 2018F. Our technical chartist indicate that the near-term support for FSSTI may hover in the range of 3,370 and 3,470. We expect to see more earnings upgrades ahead in the non-REIT earnings season, potentially led by banks (on the back of lower credit costs, stronger loan growth and more aggressive NIM expansion), tech/manufacturing (steady volume increase), capital goods (higher order wins) and consumer/gaming (stronger topline growth). No one knows how long the correction will last but we see the opportunity to prepare a shopping list of ‘must-own’ stocks backed by fundamentals. Keppel Corp – buy at S$7.95. S$1.02 for its O&M arm, at 1.2x FY18F P/BV, close to -1.5 s.d of its 10-year average. We see Keppel Corp backed by multiple catalysts e.g. land sale by Tianjin Eco City. ... or 15.2x CY19F P/E (10-year average P/E). 2H is seasonally stronger for the company and we believe its business momentum is still strong with no disruption seen across its end-customers. Its well-diversified customer base and product portfolio makes it resilient. Catalysts could come from stronger-than expected revenue and margins. ... or c.8x CY19F P/E. 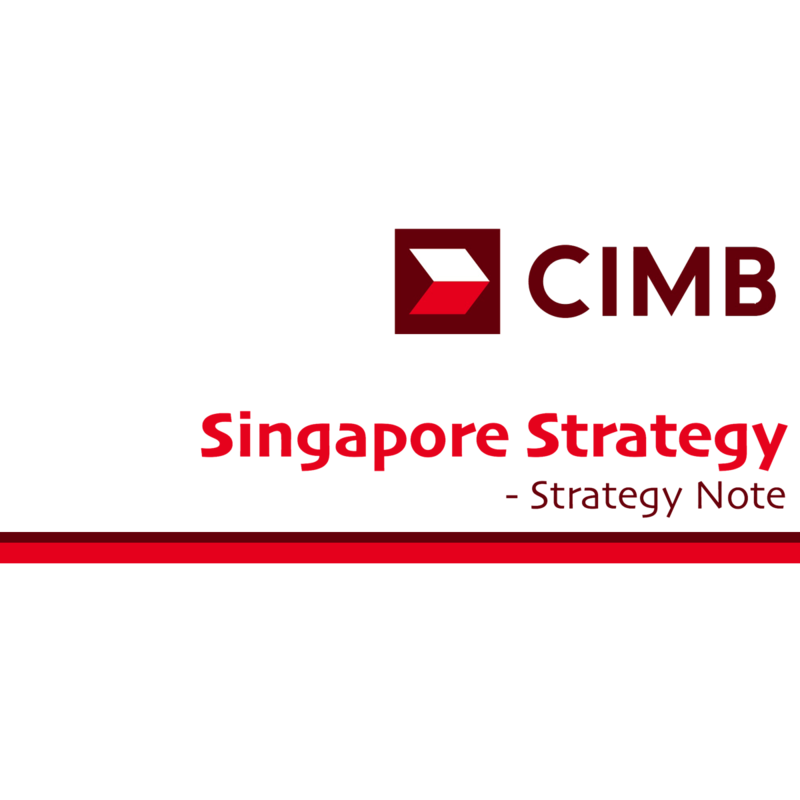 Our target price of S$6.62 is based on 10x CY19F P/E (18% discount to sector average of 12x). We believe AEM is on course to deliver 35% y-o-y earnings in FY18F, riding the firm sales forecasts from its major customer. Catalysts could come from stronger-than-expected earnings. ... or c.9x CY19F EV/EBITDA, close to -1 s.d. of its 6-year average. We believe the careful credit loosening in its VIP business could help to lift overall gross gaming revenue (GGR). ... or 16x CY19F P/E, below its 5-year average of 20x. Assuming its peer SIA Engineering’s recent earnings beat is an indication of returning engine MRO trend, we see ST Engineering benefiting due to its exposure to the CFM engines for narrow body aircraft. ST Engineering is relatively cheaper vs. SIA Engineering (> 20x CY19F P/E). Catalyst could come from stronger-than-expected earnings from aerospace and marine.